I'm in so hard for this. 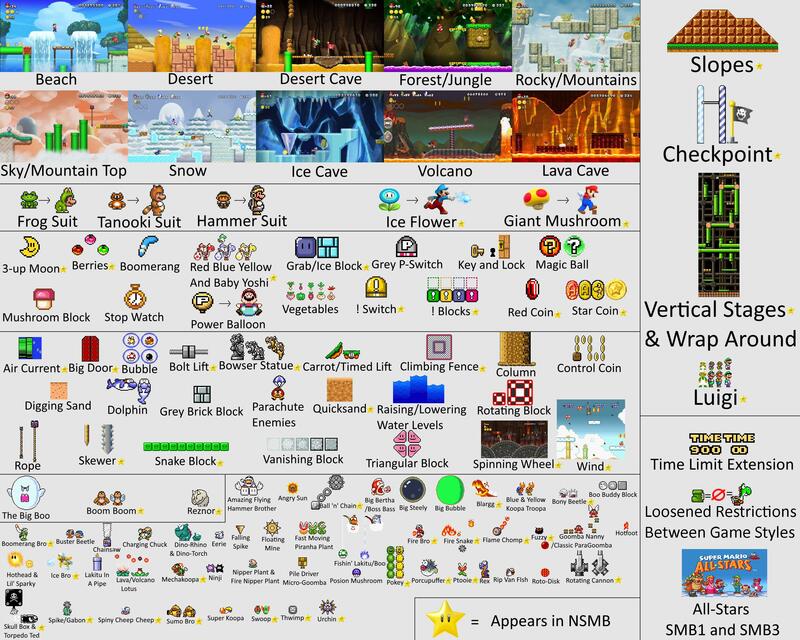 When they showed the graph paper with old school Mario levels I squeed a bit because I've done that. Now I get to do that in a Nintendo product and not, say, LBP. I'm sorry, but the three levels of depth thing broke my brain in making LBP levels. Man, if you thought the devs were trolling you with their level designs, imagine how much worse your friends will be. I'm so down for this. Don't forget they have to actually complete the level before they can share it. That's part of the point of this thread: to maintain a list of good quality non-troll Mario levels. Because I, too, have little to no interest in playing that kind of stuff. The "you must complete this level to share it" requirement is a really solid idea. Thumbs-up for that! I played enough awesome levels in LBP games to know that I don't worry about user made stuff being crap because a bunch of great stuff will be made. Turns out my roommate is psyched for this so I may just get it after all. Apparently this will have 100 Nintendo-made levels on the disc. That makes it a bit more enticing. Wow! That's a fair bit more than I expected. I do expect that a lot of the Nintendo-made levels will be the trollish type of stuff that we saw at the E3 competition. My current plan is to make a Mario adventure that rests somewhere between SMB3 and SMW. Believe the hype. My kids and I got to play SMM last weekend at a Best Buy event and I immediately put my money down for a pre-order. It's brilliant and instantly draws a crowd of onlookers cheering and making inhales and groans as the action unfolds. The preloaded levels we saw were equal parts whimsy, tech demo and brutal "What the!?" levels. Wearing a turtle shell helmet while dodging flying squids, jumping from floating vines, bouncing off chains of bullet bills to reach coins while also dodging thwomps. And that was just one ingenious level a kid put together while we were there. I cannot wait to see what people build with it! For me, the appeal of this game all comes down to curation and how easy it is to find and play the best stuff. Making levels holds little appeal, but I have no doubt that there will be some amazing stuff produced based on some of the footage from E3. Am I going to have to wade through a sea of mediocrity to find it? This was something LittleBigPlanet nailed down really well, so I hope Nintendo has some good plans for it too. I haven't followed the game too closely, so I'm not sure if they have addressed this at all yet. For me, the appeal of this game all comes down to curation and how easy it is to find and play the best stuff. That's one of the things I intend to do with this thread. Every level should be able to be completed without having to die to learn about "trick" solutions. If there is a section of a level that has a "trick" to it, the penalty for failure should be non-lethal. Every level should have either secrets to discover or ways to optimize playing through it, to encourage replaying a level for the fun of it. 1) Introducing a gameplay idea and then iterating upon it for the player to gain a basic understanding of it. For example, introducing the P-Switch early in Super Mario Bros 3 as a way for the player to collect extra coins, and to make unpassable brick walls passable by converting them to coins. 2)Utilizing a gameplay idea presented earlier, and challenging the player to achieve mastery by presenting it in a different way. Continuing the previous example, later on in SMB3, using the P-Switch to turn coins into bricks, making a difficult series of jumps much safer to negotiate. You can use this design philosophy to build a player's skills and self-confidence as they proceed through the game, and later levels can provide "easy" sections that call back upon these skills to remind the player of how much they have progressed in ability in between sections that challenge them with new ideas or new combinations of previous gameplay concepts. Marcel Ansel is contributing one of the 60 levels that will be included with the game. I wonder if they'll get Team Meat to make one as well? You don't get all the level creation tools all at once. You unlock ten per day by playing the level designer for at least five minutes. It's kinda weird. The tools for adding blocks and effects seem pretty intuitive. You can also add sound effect blocks to do things like play the Mario Paint theme or to play custom sound effects. You can toggle between play and edit mode on the fly, and you'll get a ghost of where your Mario went. 6 tile themes and 4 sprite sets (Super Mario Bros., Super Mario Bros. 3, Super Mario World, and New Super Mario Bros. U). There's a 100 Mario challenge and a 10 Mario challenge that give you 100 or 10 lives and have you play through a random selection of courses from the internet. You must be able to beat your level in order to post it online. You can sort levels online by newest added, highest rated, etc. Seems fairly straight-forward. Tap amiibo to add mystery mushrooms that let you transform into that character. If you don't have an amiibo, you can see the transformation by playing a course from the internet that includes the mystery mushroom. The compatibility list looks huge, encompassing all the Smash Bros, Mario Party, and Animal Crossing lines. Not a fan of that unlocking mechanic; dammit, give me all the level creation tools up-front! Other than that, still completely stoked for this game and I can't wait to get my hands on it. I must say, the more I see of Super Mario Maker the more I am impressed. It could be a lot of fun! I don't have a problem with it. I think they want to ease people into using the tools and I think if you just gave most people the full toolbox they might be a little overwhelmed and suffer analysis paralysis. However, there's no reason they shouldn't put in a secret code to unlock everything from the start for people who want to dive right in. That's not even in line with the original Super Mario Bros. You run full speed and oops, goomba. So you run full speed and then jump, and oops koopa. You learn by trial and error when you can and can't go full speed. And unless you found a mushroom or fire flower first, the penalty was death. You run full speed and oops, goomba. It seems to be that Nintendo's methods of drip-feeding gameplay in traditional titles is being carried over to their non-traditional ones. See also: Splatoon. I should be more specific; what you described is the trial-and-error of learning basic game mechanics. That's central to core design; gradually building the levels to push the player into stretching their skills with the core controls. I'm talking about level sections that have a single gimmick-based solution, which cannot be successfully completed the first time through without blind luck. There were examples of this in the levels built for the Nintendo World Championships, and in some of the previous demos of Mario Maker. Essentially: "troll" levels. If you're interested in a long read that explains all of this far better than me, check out Reverse Design: Super Mario World. Really fascinating insights into the development philosophy. They also dug deep into the design decisions of Chrono Trigger and Final Fantasy VI, which not only explained why all three of these games were classics that I enjoyed so much, but gave me an even richer appreciation for the thought that went into their development. I'm pretty stoked about SMM. I think it will be great fun, plus my oldest is really into Mario games these days so it will be a fun platform to start teaching him some design logic and philosophy in games. $10 off pre-order for Amazon Prime members. I know I put this as the game I wouldn't watch for news on, in whatever thread that was, but man, forget it! So one of my biggest concerns is addressed: the trouble of finding stages that are well-designed and fall within a reasonable difficulty rating. Because honestly, most of the levels I've watched YouTube videos of are just not well-designed or are simply too annoying/arbitrary in difficulty. I grow more and more excited for Super Mario Maker, and am happy to see the care with which Nintendo is building it. If we're lucky, maybe we'll get further "Maker" games in the future for other styles. I'd love a Metroid Maker or something else along that line. Yes, I realize I am probably being quite ridiculous with that idea. Also, it's killing me wondering why so many people apparently already have access to the game! GIVE IT TO MEEEE.